and half the time, I’ll be crawling under my desk to unplug the cable modem because I don’t want to deal with the annoyance of having it replaced after it gets struck by lightning. again. ya gotta mow the grass in the morning around here, folks. and if you don’t do it every week, you pay for it by pushing the mower two feet forward, pulling it one foot back, two feet forward, one foot back . . . or it stalls out. 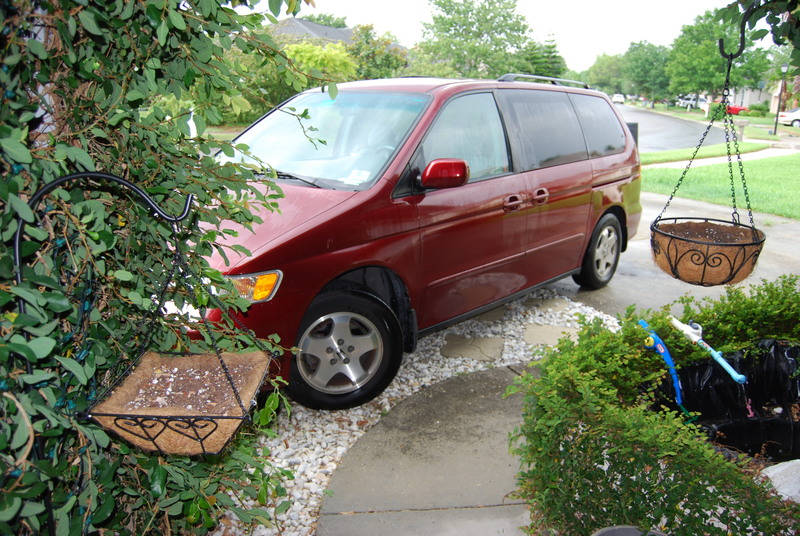 It was POURING when PinkGirl and I tried to make a mad dash into the house this afternoon, so I actually pulled up past the driveway, onto the front path, right up to the front door (can’t park in the garage, we put up a wall to create a laundry room). ← DisneyQuest. pros and cons. Yes, it’s been a rough storm season already this summer. Oh…and the grass is out of control here also. Love the parking job! LOL! I’m in Jacksonville now – moved two years ago from Daytona Beach. Daytona got more of the afternoon showers than Jacksonville. I kind of liked the showers each day. Those radar shots are kind of freaky though. Eeek. Ahh, yes, the afternoon rain showers when it’s blistering hot. What fun! Oh.My.Stars Julie…I had NO idea you were a FL chick too! How awesome is that??? Our doppler radar looks like that too EVERY DAY!! !